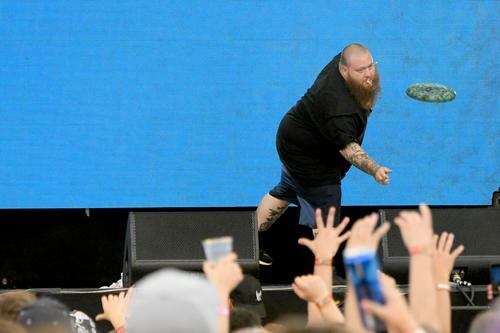 Action Bronson was arrested for the mildest of offences while he took the stage in Kosovo at a music festival. The video below documents Bronsolini's illegal action before it was reprimanded by local police. A slick guitar riff offers him a brief intermission to light up his favorite strain. According to TMZ, the Queens-bred rapper was booked right after his set, before exiting festival grounds. According to the report obtained by TMZ, after lighting his joint and taking a few puffs, Action Bronson tossed the joint into the crowd, where it either burned someone on contact, or made someone's day. Kosovar law prohibits the possession or consumption of pot under any circumstances. The marijuana that surfaces in Kosovo is generally exported from Albania, where Bronson's father grew up. Bronson seems to have posted bail or reach a backroom deal, because reports indicate that Kosovar police granted him his release. TMZ was able to translate this sentence without a language expert on hand: "Following the interview with the competent prosecutor's order the same was released." While less than coherent, it does communicate a formal discharge of some kind, from a spokesperson from the local sheriff's office I might add.